Aaron Baker has walked across Death Valley, biked in three Los Angeles marathons, and pedaled his way across the country twice. These athletic feats would be considered amazing accomplishments for most people; for Aaron, who was told by doctors that he had a one in a million chance of recovering from a Motocross accident that left him with a severe spinal cord injury at the age of 20, these accomplishments are even more impressive. Aaron's remarkable recovery and efforts will be the subject of an upcoming film, entitled Coming to my Senses. The filmmakers aim to use Aaron's passion for adventure, both before and after paralysis, as a portrait of movement: to explore how movement relates to one's goals and dreams and how it changes one's motivations and perspectives. The film focuses on the shifting values which occur when one must focus less on doing and more on being. For Aaron, the shift in motivation and perspective he experienced during his journey to recovery inspired him to help other people with disabilities or chronic conditions overcome a troubling lack of specialized wellness resources, which he refers to as the "gap between rehabilitation and regular fitness." With his mom, Laquita Dian, and Clinical Exercise Physiologist Taylor Isaacs, Aaron started a gym that provides accessible and customized training for people of all abilities. Aaron's recovery was as remarkable as it was challenging. "Prior to my injury, I had been very athletic and very competitive. After the accident, I wasn't trying to 'get back' to anything. I accepted my new life. The Motocross chapter of my life closed the second I hit the ground." Although he had to give up his involvement in Motocross, Aaron's shift in priorities was not a reflection of his motivation to overcome his injury. Instead, it was a commitment to healing, largely propelled by the motivation and hard work of his mother. "I rebelled. My mother wasn't going to allow a negative prognosis into my awareness. My focus was intense, and my mother facilitated an environment that poured energy into regenerating myself." His focus and defiance paid off. Within the first year, he went from unable to move, to wiggling his toes, to standing in water. Unfortunately, Aaron faced a significant hurdle after only one year when he was discharged from physical therapy and left with no options to continue working on his recovery. "I had nowhere to go to help take me to the next level. I became dejected because I had a fire inside and no outlet for it. My thoughts became dark." Aaron credits his mother for what happened next: unwilling to give up on him, she scoured the country for the next step and connected with Taylor Isaacs, a former kinesiology professor at California State University, Northridge. As Aaron and Taylor formed a partnership to work on his long-term recovery, they also sowed the seeds for a business idea that could address the gap in rehabilitation services for people recovering from injury or disability. The Center of Restorative Exercise (C.O.R.E. 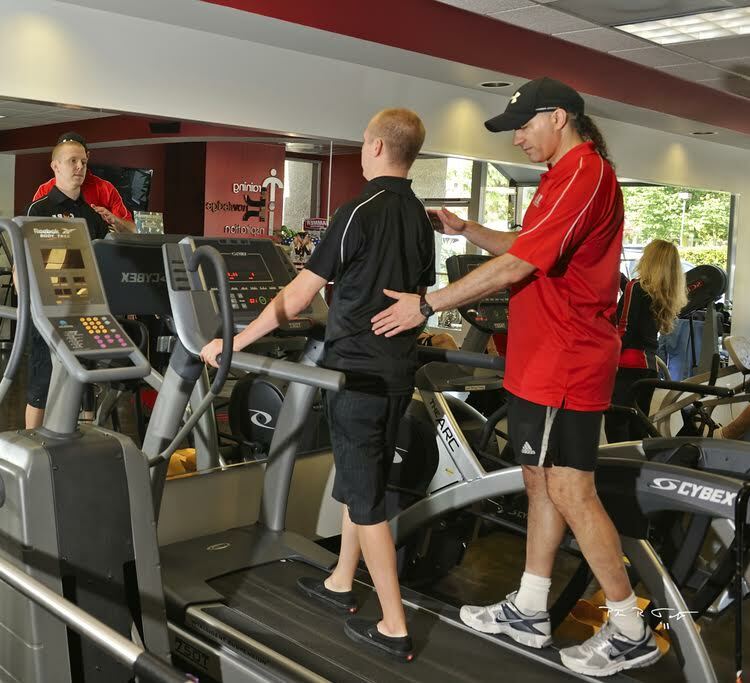 ), a state-of-the-art, fully accessible gym welcoming people with and without disabilities, was born. Taylor's methodology provided the basis for the gym's exercise, focusing on musculoskeletal conditioning, flexibility, cardio, balance and stability, posture, gait mechanics, and performance. Meanwhile, Aaron and his mother drove the image of the company and promoted the idea nationwide. "We were a tight-knit unit hell-bent on bringing this type of exercise to the general population." At the beginning stages of C.O.R.E. 's development, Aaron biked across the country and visited hospitals and outpatient centers to discuss the idea of starting a gym that would assist people with disabilities with restorative fitness. "The response validated that this type of facility would be useful. They recognized that there was a massive gap between rehabilitation and regular fitness, and that nobody filled that role." While Aaron and Taylor created a successful business, they also created a strong and supportive environment. The gym's members include people from all walks of life, including young athletes with orthopedic injuries, middle aged individuals interested in losing weight, veterans, stroke patients, high-level quadriplegics, and people of all other abilities. Aaron says that the feel of the environment is extremely important to the gym's goals. "We don't want members to feel like they're in rehab, but that they're in a space where the human spirit is prominent." It is also important for gym members to feel that they understand how they are improving their quality of life and that they are active in promoting their wellbeing. "The staff members educate everybody on the science of human movement. We want them to understand what they are doing and why they are doing it." Aaron's plans for the gym's future include hopefully expanding its reach across the country while assuring the quality of its service. Driving its brand is a work in progress--just like himself. Aaron continues to work on his recovery, as well as his athletic goals. "I am a recovering quadriplegic. What I do determines whether I progress or regress." With regard to his accomplishments, he has made impressive progress. Aaron will be the subject of an upcoming film project entitled Coming to my Senses, which will cover his remarkable 20-mile walk across Death Valley, as well as illustrate the challenges he has overcome. "Early in my recovery, the journey this film illustrates would have been deemed impossible by most. When I reflect back, I am astonished and grateful for how far we've come." To complete the trek, Aaron said that he broke it down into small challenges, and then all of a sudden, he had crossed the desert. In a way, this characterizes the larger journey he took from the very beginning of his recovery: first with the small goal of wiggling his toes, all the way up to biking the country and walking the desert, Aaron has overcome challenges that have amounted to enormous accomplishments. Aaron isn't done with these goals, both for his gym and his self. "My next discipline is getting married. I'm training to walk to the best of my ability down the aisle for my wedding this summer." While seemingly small in the scheme of such fantastic athletic feats, this goal relates to the most important part of his life--his family. "Family was the key differentiator in my recovery. It wouldn't have mattered how badly I wanted to recover. Without my mother facilitating the opportunities I had and the support of my father and sister during that traumatic time, none of it would have been possible." If you would like to know more about the film project Coming to my Senses, click here.